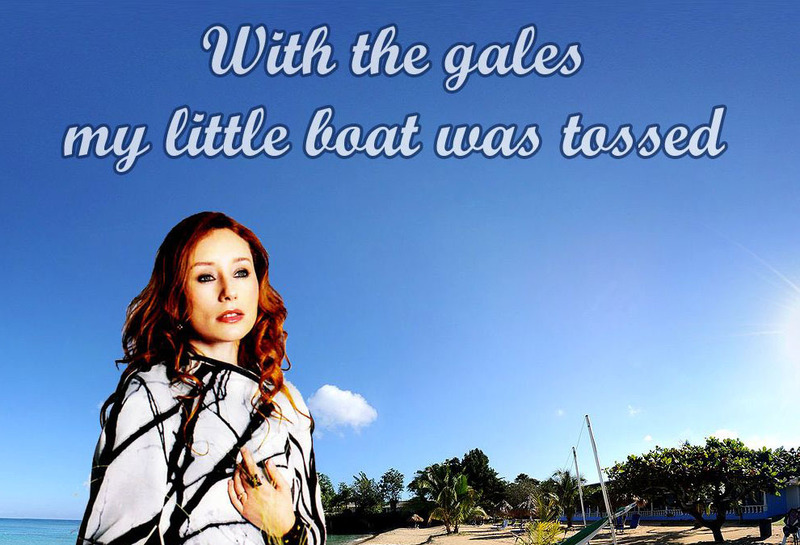 SEWALL’S POINT — All kinds of people come to visit singer/songwriter Tori Amos at her vacation home on the Indian River — family, friends and sundry showbiz types. The last thing the rock star or her parents expected was a scene from Gilligan’s Island. On Sept. 5, during Hurricane Frances, a 42-foot twin-engine cabin cruiser with a white and green hull destroyed Amos’s dock and planted itself, on its side, in her back yard. With large chunks of the outer skin torn away, the mortally wounded boat comically came to rest looking like the S.S. Minnow of situation-comedy fame. Amos, who’s been at her house in the English countryside for most of this year, wasn’t laughing. Five weeks passed before the mystery vessel was identified. The singer’s father, Edison Amos of Port St. Lucie, looks after the property while Amos is away. Since the boat first appeared in his daughter’s back yard, he said, no one – not the owner, not the insurance company, not a salvage company – had contacted him or his wife, Mary. “If my boat crashes on your property, and certainly if my boat is missing, I’m going to try to find out where it is,” he said. Known for platinum albums Under the Pink, Little Earthquakes and Scarlet’s Walk, Amos bought the property on her mother’s advice, sight unseen, in 1995. She spends fall and winter there with her husband, sound engineer Mark Hawley, and their 4-year-old daughter. Her father, a retired Methodist minister, said there was considerable damage to the grounds, which he was hoping to have cleaned up before the family returns from England next month. Because the bow was buried in the remains of the Amos dock, the license number was not readable; however, an identification number stamped into the hull was traced to Alphonsus and Sherie Zobec of Palm City. When Frances hit, the boat, called “Dealer Ship,” was moored four docks up the Indian River from Amos’s property. Alphonsus Zobec said he first inspected it Sept. 6, and immediately contacted his insurance agent. “The insurance company’s been there like 10 times,” Zobec said. “They’re trying to figure out how to get it out. They assured us the dock is going to be taken care of. Sherie Zobec said she and her husband were well aware their boat had made landfall in a famous singer’s back yard. “I wouldn’t even know how to contact the woman, but I would have assumed that the insurance company would have written a letter,” she said.